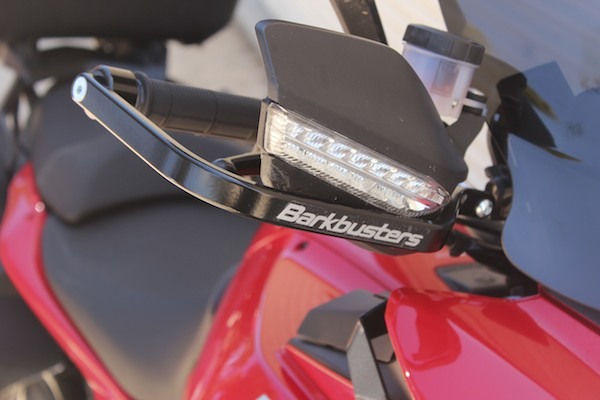 DUCATI’S MTS1200 Multistrada S Touring is the fastest, strongest and most versatile machine in the category we describe around the Cycle Torque office as ‘Any Road’. We’ve had one at Cycle Torque HQ for nearly a year now, and we plan to keep it around for a little longer than usual for our project bikes. We like it that much, we aren’t letting it go easily. We won’t be letting go of our Multistrada easily…fastest, strongest and most versatile machine in the category. There’s a growing group of bikes which are capable of taking on almost anything you’d describe as a road – sealed or unsealed – but aren’t really full-on Adventure bikes. Honda’s got its new Crossrunner and Crosstourer, Yamaha’s got the TDM900, Kawasaki’s new Versys 1000 is in the category and Suzuki’s V-Strom range are there, too. All capable and versatile, but not ‘crashable’ enough for us to recommend as Adventure bikes. What they are, and the Multistrada is really the one to judge the others against in this category, is fast, comfortable and capable. 4-in-1 Ducati promote the Multistrada as four bikes in one, because you can change the settings on the fly through Sport, Touring, Urban and Enduro. Each mode gives a distinct feel to the bike, each makes the bike that bit more versatile. Enduro and Urban are the tame modes, the computer limiting power output to 100 horses, which is more than enough for blatting through traffic or up a dirt road. In Sport and Touring modes you get the full 150 horsepower, although its delivery in Touring mode is toned down a bit. Sport mode is a wicked place full of instant throttle response, massive wheelies and immense fun. No other dirt-road capable bike is this much fun up a winding bitumen road. Changing the modes also changes the suspension settings. Sport mode is the stiffest, as you’d expect, with each mode being tailored for the conditions. You can feel the suspension settings change under your bum as you use the indicator cancel light to switch between modes. Although the Multistrada S Touring is very powerful and incredibly fast, we also believe it’s one of the safest bikes you can buy today. 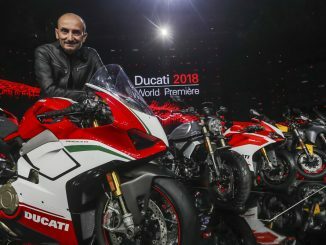 There’s ABS and DTC, so the brakes won’t lock up and DTC is Ducati’s traction control, and with 150HP available spinning up the back tyre isn’t possible, it can be easy. Other aspects which make this bike safer than many others include comfort (which reduces fatigue), long travel suspension (which takes the harshness out of poor roads) and great visibility thanks to the riding position and the best mirrors ever on a Ducati. And love it or loath it, the Multistrada, despite the upright riding position and wide handlebars, is still very much a Ducati. After all, the engineers assigned to the project were told to build ‘The bike they would want to ride on the road’, and these people were Ducatisti, of course. So there was never going to be a dirt-road friendly 21- or even 19-inch front wheel, it was never going to be fitted with a tame engine, it was never going to be anything but a versatile Ducati, complete with blistering performance and superb handling. 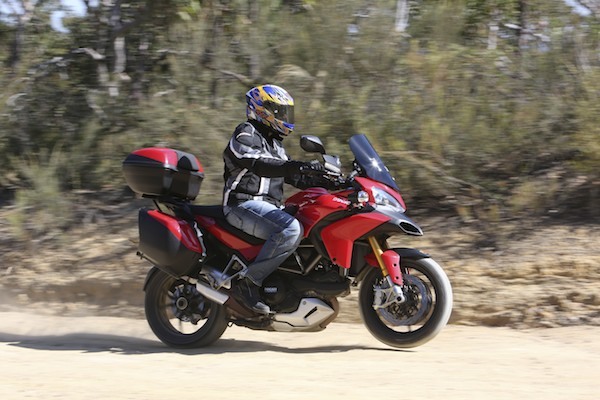 There’s no getting away from the fact the Multistrada is a big bike though. The seat height is high, the seating fairly roomy, the weight of the machine not insignificant. Once you’re rolling though it’s very well balanced, and the position of the footpegs good for standing if the terrain gets rough.